After another long journey down Snake Way I made it home to an extremely early dinner which, by our standards, is any dinner before 10:00 PM. What better way to celebrate this early arrival home than with a completely disjointed dinner with courses and beverages that don't go together in any way, shape, or form? 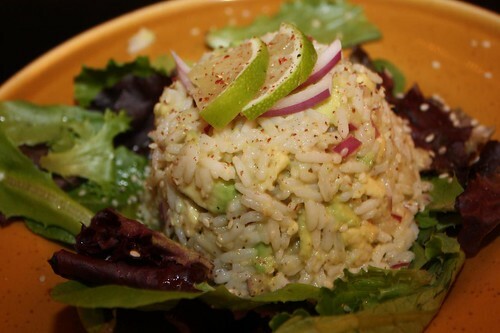 I made a salad with the leftover rice, red onion, avocado, sesame oil, rice vinegar, Sichuan pepper, and sesame seeds. Initially I was going to make rice balls but instead I decided on molding it over some baby greens. We made some gnocchi to go with the leftover pistou in the fridge and served it up with a little grated Parmigiano-Reggiano. 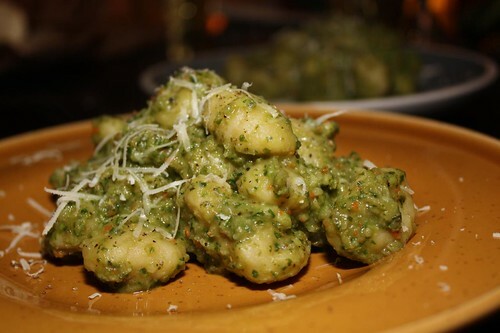 Jen commented during dinner that pistou was like something that one of those "sneaky chef" types would make in lieu of pesto in order to trick children into eating something more healthy. You know who we're talking about. The person is usually called "The Sinister Chef" or "The Devious Cooking Diva" or "The Culinary Trixter." There is a 75% chance that they are the unknown wife of a very famous celebrity with nothing else to do. They write cookbooks where you cook chocolate chip cookies with some spinach in them and give them to children who receive some tiny quantity of nutrients when eating the cookies without knowing about it. The covers of these cookbooks often feature cartoon caricatures of said celebrity wife winking at you while holding a bunch of collard greens behind her back. It is also likely that she will be holding a finger to her lips implying that you cannot tell her underhanded secret to the children or all will be lost. 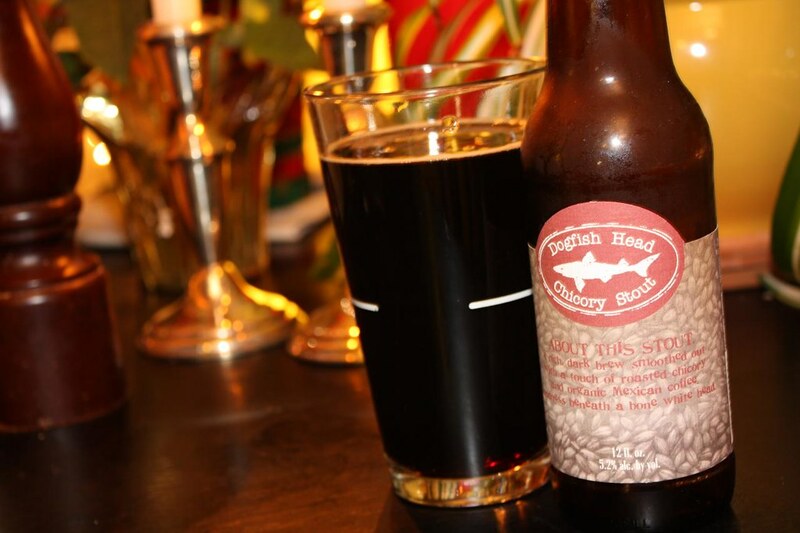 For dessert I had this chicory stout from Dogfish Head. It's brewed with whole-leaf Cascade and Fuggles hops and I'm sure that means something to someone. Now the race is on to clear out the perishables from the fridge before our next Christmas celebration begins. 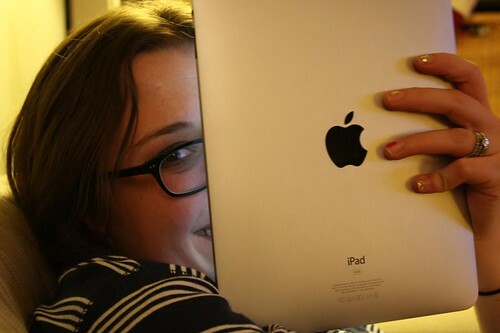 It's in Jen's hands now. 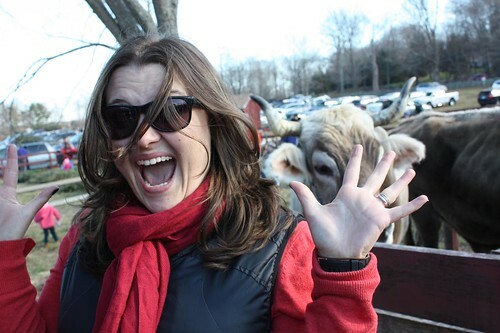 Godspeed, Jen. Route 95 was a disaster. It often is this time of year. That is why I check the traffic regularly before leaving work. After seeing an intense band of Red through much of western Connecticut this evening I elected to take the Merritt Parkway home. 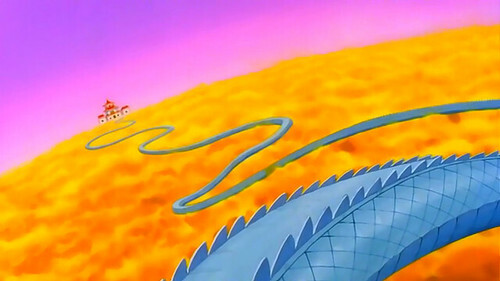 The Merritt Parkway is a lot like the Serpentine Road in Dragon Ball Z. In fact the two are nearly identical. Both are full of twists and turns, both are suspended high above orange clouds, and if you fall off of either you land in Connecticut. As Jen worked on getting dinner ready I decided to open some wine. 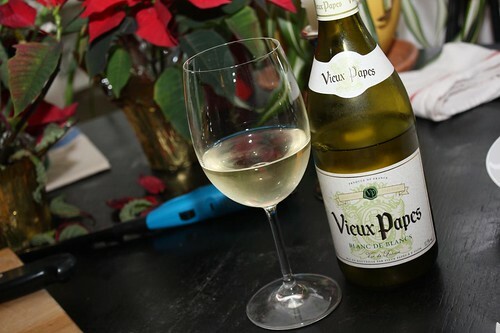 I cracked open this bottle of Vieux Papes Blanc de Blancs. Now my French is a little rusty but after tasting this I believe that Vieux Papes Blanc de Blancs translates as Very Crummy White Wine. My tastes in wine are about as sophisticated as your average fourth grader but this was not really an acceptable wine. In fact I even felt guilty in adding my glass to what Jen was making for dinner for fear of ruining it. After one sip I quickly switched to the last bottle of Weyerbacher Winter Ale. For dinner Jen did an exceptional job of cleaning out the fridge by making this pistou with leftover produce in the fridge. 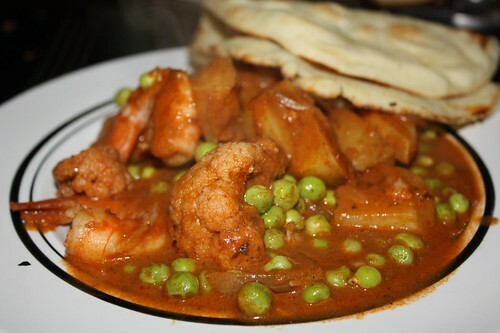 She used broccoli, cauliflower, carrot, garlic, basil, and a little turkey stock to make this sauce which she served with shrimp and scallops cooked in white wine. Also we had large slices of French bread. You can always tell when Jen is cooking because she almost always incorporates the food processor. I'm pretty sure I've never used the food processor for anything I've made during the life of this blog. The main reason is that I can't be bothered to clean it. With me watching endless episodes of Dragon Ball Z and Jen able to play Sim City on the iPad it's pretty hard to imagine a better time time after Christmas. 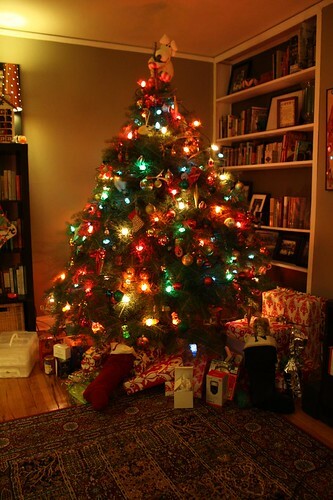 And to think, our Christmas is only two-thirds over. Christmas is nearly upon us. As we let the food in the fridge dwindle with the holiday approaching there are not quite as many options as we would normally be blessed with. 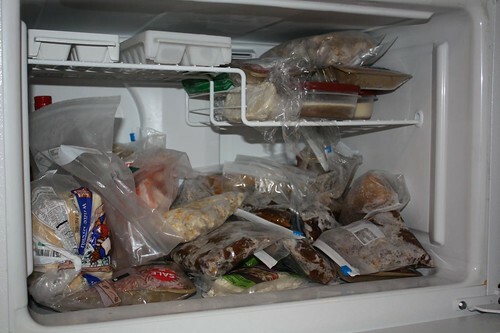 However, the leftovers from Canadian Thanksgiving are still the most populous residents in our small freezer. 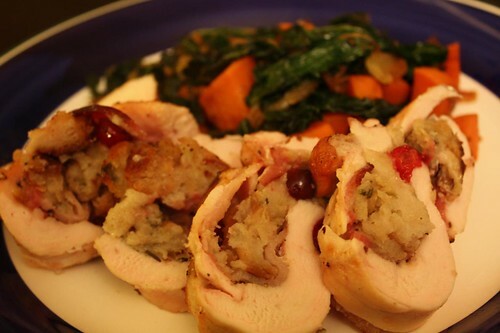 I took some chicken breasts, butterflied them, and pounded them flat, then lined them with strips of bacon and defrosted stuffing from the Canadian holiday. Then I sprinkled them with cranberries leftover from Jen's holiday baking. In another pan I browned some crushed garlic and vidalia onion in a little butter and olive oil. 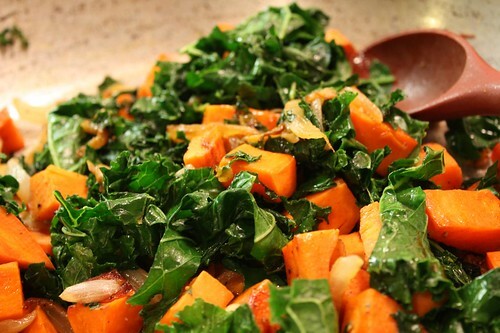 Then I threw in some peeled, chopped sweet potato, stewed that down for a bit, and tossed in some kale that I'd chopped in ribbons. 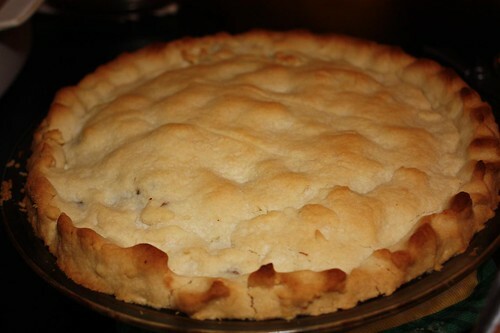 I seasoned it with salt and pepper and finished it with a light dusting of freshly grated nutmeg. I spotted this item at the store the other day. It was $16.99 and I had one more person I hadn't gotten a Christmas present for yet: me. 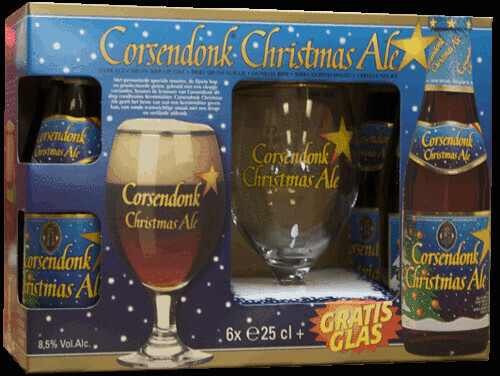 As a fan of Belgian beer fan I figured how could I go wrong and for less than $20? I was prepared for this to earn me a healthy helping of disgust from Jen but she was surprisingly accepting of the purchase. Even though most years she gets upset with me if I buy so much as a replacement pen for myself within three months of Christmas. 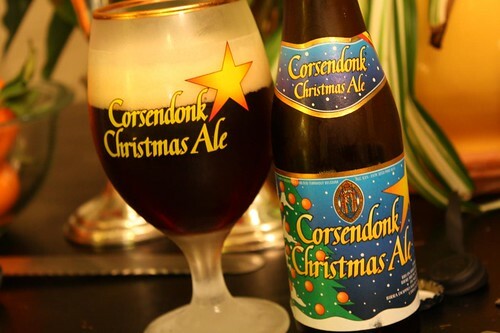 I must say this Christmas Ale from Corsendonk is truly one of the favorite beers of all time. What can I say? I'm good at picking out presents for me. 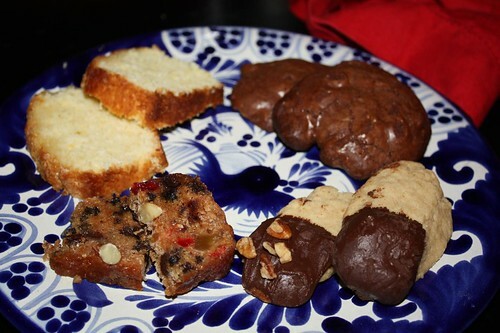 Jen spent pretty much every waking moment of the weekend baking cookies, breads, and bars. 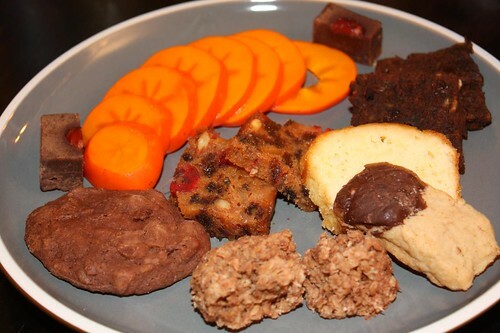 This is just a small assortment of some of the treats she made. And just a small example of why it's so easy to get stomach aches this time of year. 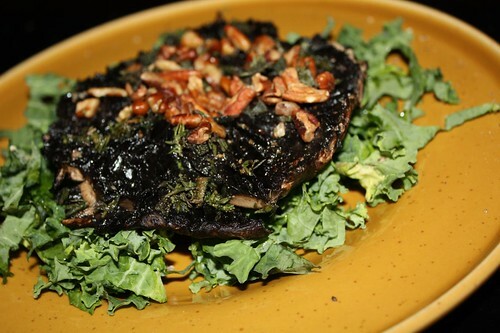 For a while now there has been a trio of portobello mushrooms living their sunset years in our crisper. 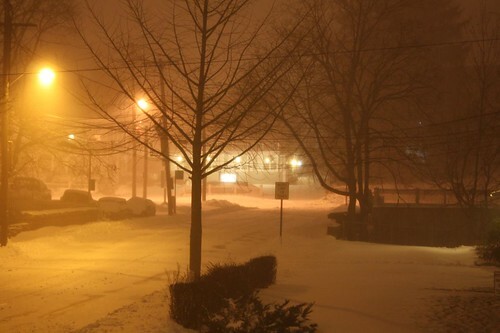 Last night, I'm excited to say, they got the call! I roasted them in the oven with some olive oil, salt, pepper, fresh sage and thyme, and toasted pecans. I served them over a bed of kale as a salad. It was pretty tasty but probably would have been even tastier if I'd cooked them up a week (or even two weeks) ago. The last leftover (for the time being) that needed to be tackled in the fridge was the leftovers from the beer and brats on Sunday night. So I crushed some garlic and toasted it with some olive oil and tossed in some chopped onion and carrot. 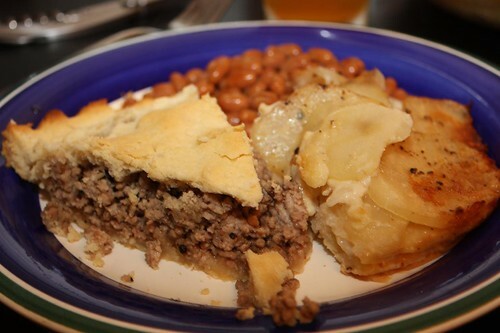 When they cooked down a bit I also added a cubed russet potato. Then I simply added the remaining beer brats with their cabbage and bacon and cooked it down with some turkey stock from Canadian Thanksgiving. 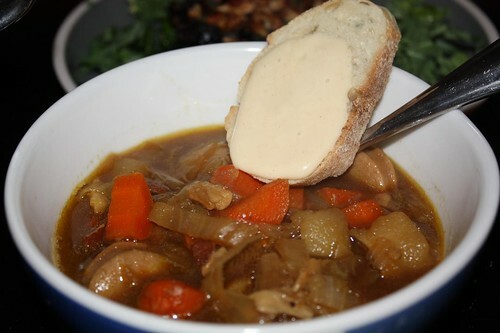 The resulting stew was pretty tasty. I also made a mustard aioli with my favorite Sweet Smooth Hot mustard from SchoolHouse Kitchen. I put it on some baguette slices (would have been better on pretzel bread) as an accompaniment. 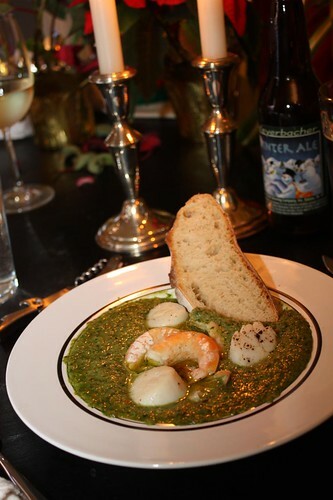 I call this dish German Bouillabaisse. 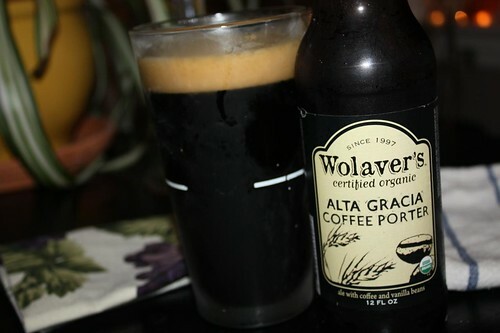 Alta Gracia Porter by Wolaver's (Otter Creek). I was right in saving it for after dinner in that the coffee taste was even stronger than I'd thought it would be. With every sip I visualized cracked coffee beans, like the chocolate covered espresso beans you can purchase as a snack. It was very good but probably not a beer I'd rush out to purchase in quantity for every day drinking. I wonder if it has any caffeine in it. I wonder if it's like a legal version of Four Loko. Of course there has always been a legal version of Four Loco called an Irish Coffee. I guess because Irish Coffee doesn't come in a can with EXTREME fonts and fluorescent colors it doesn't pose the same risks. Kids. They'd drink Drano if it came in a colorful can with a snazzy logo. Up until fairly recently our freezer has been stuffed beyond capacity. However, a month-long battle has slowly whittled down our inventory so that we can actually fit new items back into it. Much to my annoyance I returned home yesterday to find that Jen had gone shopping and purchased things that needed to be frozen! While this was a bit of a step backward I guess it's nice to have things we actually need in the freezer rather than just packing it full of holiday leftovers that I need to struggle to come up with uses for. 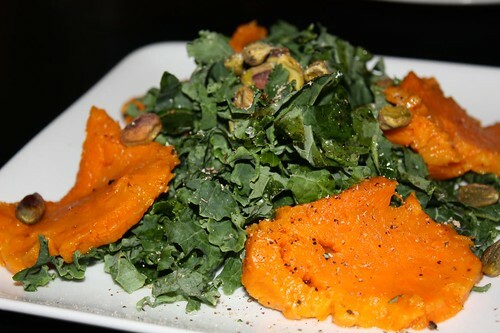 Last night Jen roasted a sweet potato which I cut into coins and served on a bed of ribbon-cut kale with pistachios, salt, pepper, olive oil, and freshly grated nutmeg. The nutmeg was a last minute addition but it worked pretty well. Nutmeg, it's not just for eggnog any more. Jen also threw the thawed leftover meatloaf from last month into the oven. I made some buttered egg noodles with chopped parsley and a sauce for the meatloaf out of spicy ketchup, Worchestershire sauce, Lyle's Golden Syrup, and ground cumin. I made meatloaf sandwiches with the leftovers last month so I wanted to try something different. 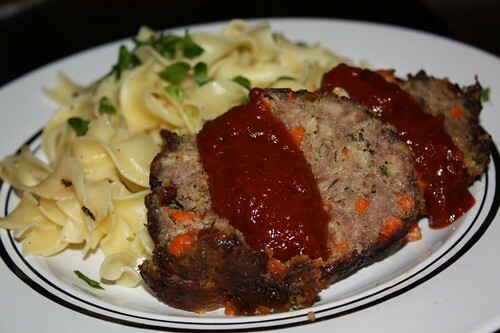 Looking for ideas I typed in "leftover meatloaf" into Google and checked out the results. It was pretty disappointing. The Internet has become so inundated with crummy "how to" sites that it's almost unusable. 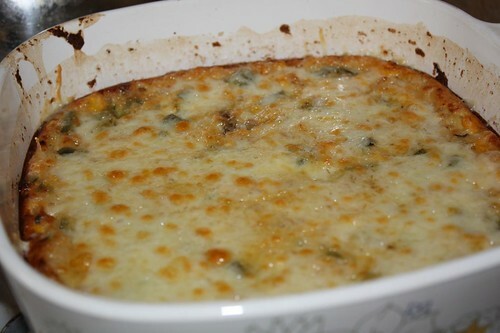 One site included the idea to toss it into a casserole dish with 'tater tots and Velveeta slices. Not even regular Velveeta, but the sliced Velveeta. 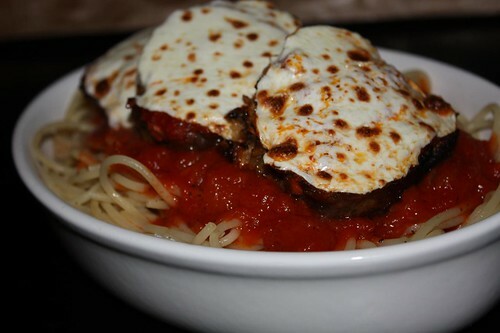 My favorite innovative idea for leftover meatloaf was the idea that you could freeze it and make it for dinner later. Thanks, assholes. After about two minutes I gave up on the Internet and just tossed it together with some tomato sauce and pasta to make meatloaf parmesan. 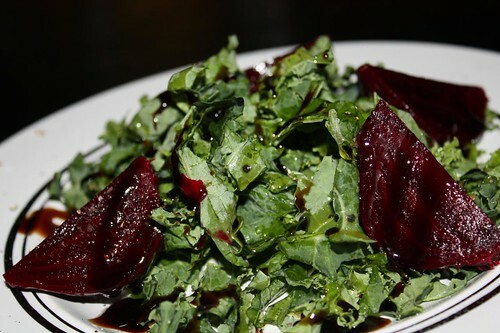 As an accompaniment I made this salad of beets and kale with balsamic glaze, olive oil, salt, and pepper. 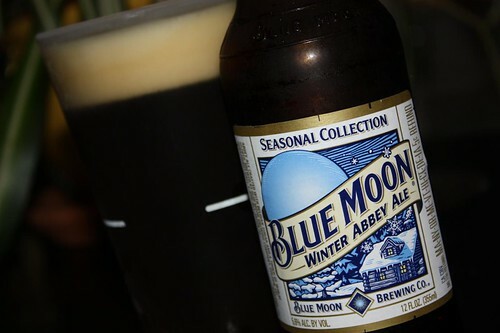 For beer I had the Winter Abbey Ale from Blue Moon. At this rate I may be into the Summer beers by January. I think I might need to slow down with the seasonal brews. Perhaps I'll take to drinking mead until the the seasons catch up with me. Today was far too rainy to go to the farmer's market. This worked out well because we still had items in the fridge from last week's trip. I discovered this late in the game when opening the crisper revealed some produce that needed to be used without delay. 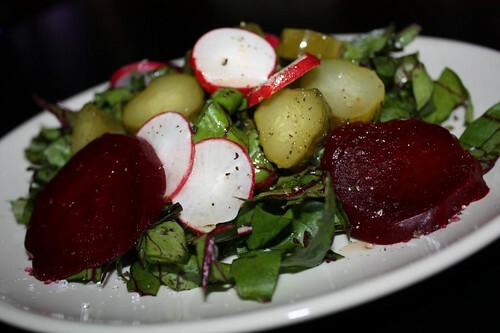 I made this salad by cutting beet greens into ribbons and topping with slices of warm, cooked beets, dill pickle, and radish. Then I drizzled sherry vinegar and olive oil over it with salt and pepper. This was unorthodox but quite tasty. 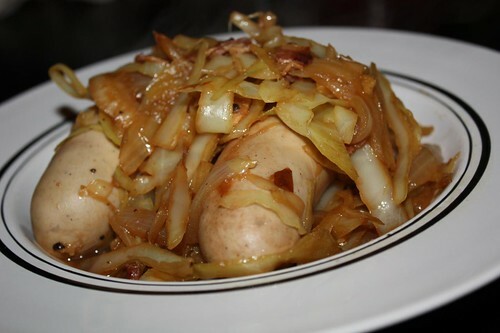 I thawed some bratwurst that we had in the freezer and cooked it with rendered bacon, crushed garlic, onion, and cabbage with a little olive oil and a pat of butter. After stewing this all down together I added a bottle of Weyerbacher Winter Ale and finished it off. 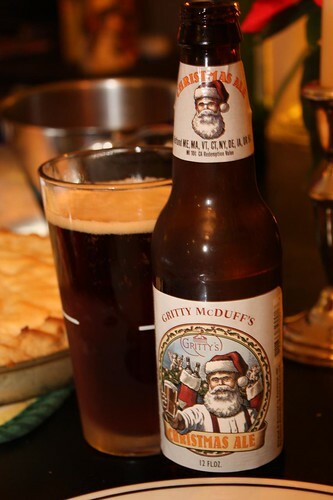 This was probably far too good a beer to use in this recipe but it seemed seasonally appropriate. I picked this beer very carefully. 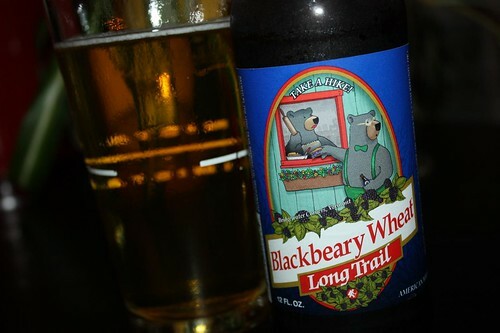 I love Long Trail and all that they produce but my main reason for picking this was because I haven't seen my father-in-law comment recently. Fruit-flavored beers really get his goat so I knew this would be sure to rile him up. One problem with this is that while he hates fruit-flavored beers he loves bears so I thought this may put him in a bit of a moral quandry and he will have to think very carefully about how he responds. I'm pretty sure that the fruit-flavored nature of this beer will not be made all right by the bear theme. However, it will be interesting to see how he handles this delicate situation. The ball is in your court, Gary. 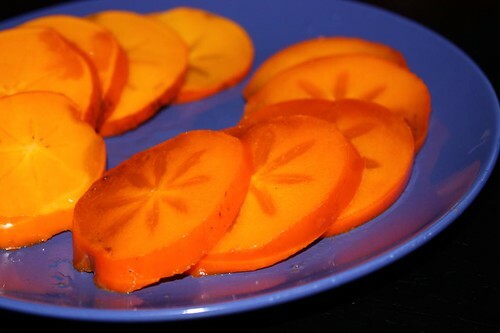 For dessert I sliced up some nice ripe persimmon. There is nothing better than a nice ripe persimmon. Except for a bunch of candy bars which we also had. There is no culinary romance in having a bunch of Butterfingers though. Tonight was a night to clean out the fridge and the freezer. It just so happens that most of the things in the fridge and freezer happen to be of a pork-related nature. Therefore it was much like an episode of Iron Chef in that I needed to prepare as many pork related items as possible for dinner. The only major difference was that I did not make a ham and shark fin soup which most certainly would have happened on Iron Chef. In fact, ham was the only pork ingredient that made it through the evening untouched. 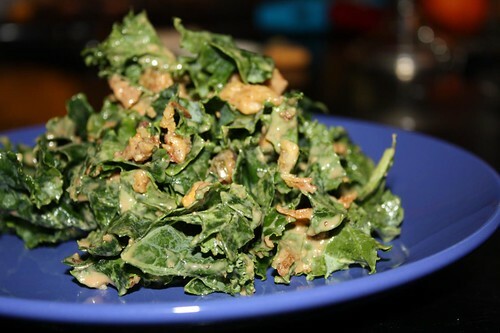 I started off by making a salad with the leftover butter lettuce and some shredded kale. 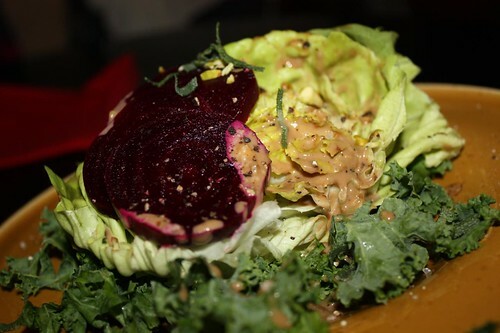 I topped it with sliced beets and chopped pistachios. 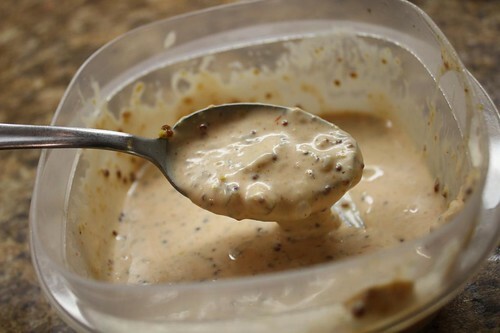 For dressing I made a dressing with some tahini, water, fig spread, ginger preserves, and balsamic vinegar. 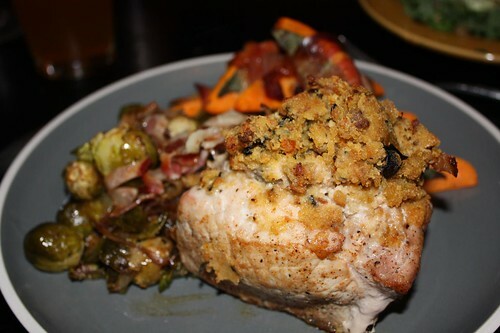 For the main course I stuffed some beautiful center cut pork loin with a generous amount of leftover cornbread stuffing from Canadian Thanksgiving that I took out of the freezer. 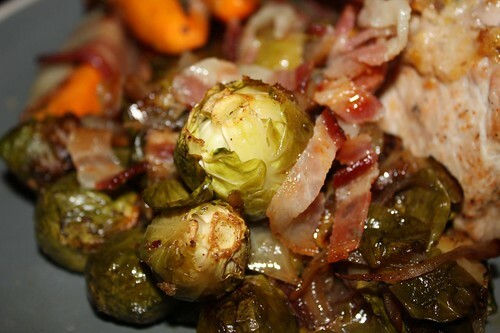 I had a bag of Brussel sprouts dying a slow death in the crisper so I rendered some bacon, cooked down some garlic and red and yellow onions, and then tossed in the trimmed sprouts. The pan got a little dark so I deglazed it with some apple cider and sprinkled the crispy bacon on top when it was done. Based on Mark Bittman's recipe I peeled and cut these sweet potatoes into wedges and par-boiled them. Then I topped them with sage leaves and alternately wrapped them with either prosciutto or bacon before roasting them in the oven. I only used the bacon because I didn't have very many prosciutto slices left but we both ended up liking the bacon version much better. 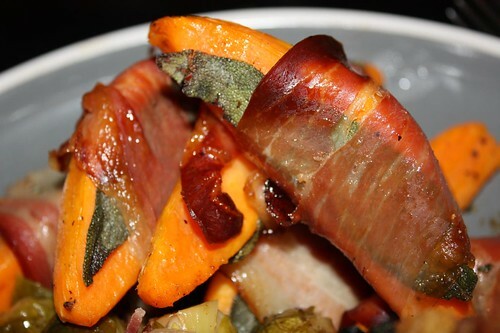 So we had bacon, pork loin, sausage (in the pork stuffing), and prosciutto around the sweet potatoes. I'm not sure if we lose points from our Hanukkah dinner last week. Perhaps it would have been better form to at least wait until Hanukkah was over before having this dinner. Oh well. Leftovers don't wait. 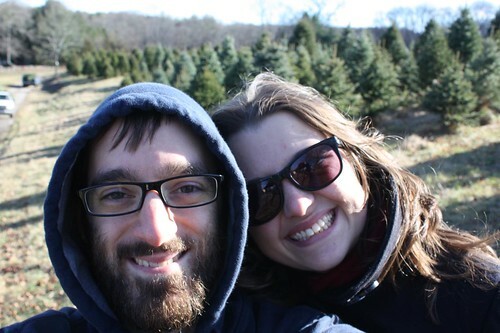 Apparently last year I didn't mention anything about our outing to cut down a Christmas tree. Normally I post such events on the blog as to use them for future reference. This year we got a recommendation for a good place to go cut down a Christmas tree. When we got there we discovered it was the exact same place we went to last year. This ended up being fine since it happened to be a great place. The place was Maple Row Tree Farm in Easton, Connecticut. We managed to get a type of tree we'd never gotten before but I can't really remember the name of what type it is. The rustic outdoorsman at the entrance rattled off some of the types of trees they carry but he could have been making them all up as he went along: Douglas Pine, Colorado Blue, Norwegian White. Come to think of it he may have been listing the names of Harry Potter dragons. 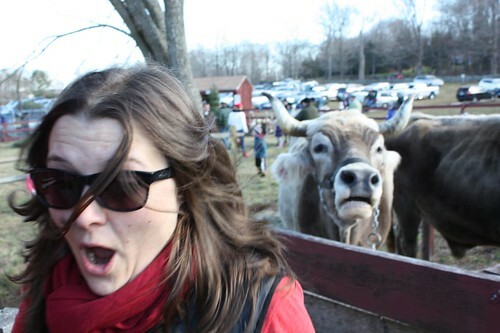 Just like last year they had Fred & Bill the oxen available for children to look at and torment. Jen decided to get in on the action and pose with Fred. Fred didn't take kindly to this and made a loud noise which scared Jen in this moment which is the finest I've ever captured on film. Or SD Card. Earlier this week I had concocted a plan. 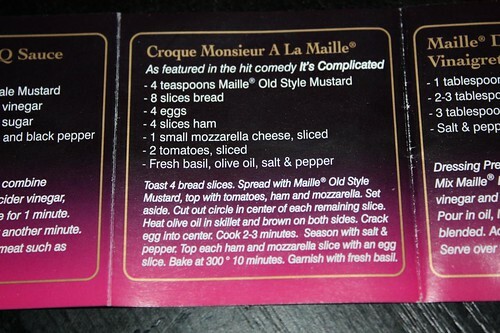 After my investigative report on the Maille mustard and It's Complicated movie tie in I had the idea to make Croque Monsieur and watch the movie It's Complicated. To assist us in this we invited our good friends Paul and Caolan over to share in the madness. This is likely the stupidest idea I've ever had in my life. 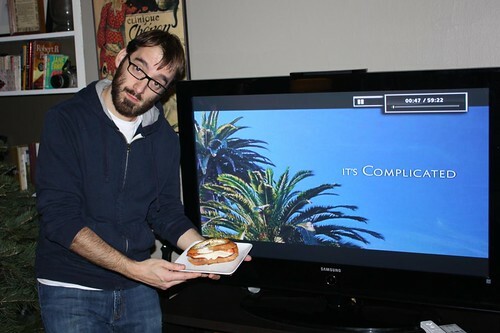 The main problem with the idea is that none of us really wanted to watch It's Complicated. Particularly with the Christmas season upon us. However, I'm all about follow through. If you put a stupid plan into motion you have to see it through to the bitter end. The first major flaw in the plan was that I wanted to follow the recipe from the Maille recipe booklet verbatim. The problem with that is that I think whoever wrote the recipe had never actually had a Croque Monsieur before. 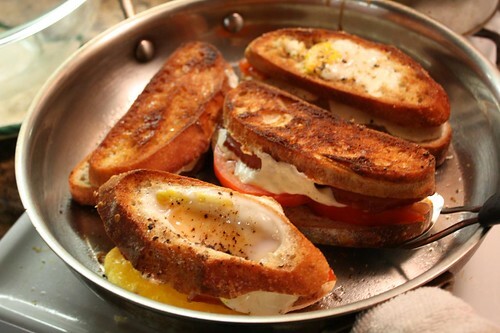 Instead what this recipe calls to make is more like a Croque Madame/Tomato Mozzarella hybrid. That being said, I was intent on following it to the letter. The second major flaw was that we had some varied diets in the group. Jen has a strong dislike for eggs of most varieties, Caolan is a vegetarian, and Paul only likes complex carbohydrates. Therefore I would be the only one who was having the authentic It's Complicated version. It was indeed very complicated getting all these sandwiches made in their various permutations. After getting them all made we sat down to watch the movie. After getting about halfway through all our sandwiches Caolan made the observation that it did not taste like there was mustard on her sandwich. This was true because in all of this fuss I had completely forgotten to put the essential ingredient on the sandwich. I blame Maille's marketing department for this one. So it was that we got out the Maille and applied it to the second half of all our sandwiches. Much to our delight this is exactly what happened in the movie! Meryl Streep is bragging about how she learned how to make Croque Monsieur in Paris yet halfway through she goes and gets the Maille and puts it on the counter (with the label carefully facing the camera). Steve Martin actually takes out a knife and applies it to the top of his sandwich. Her Croque Monsieurs looks much more true to tradition so apparently she was not following the strange egg-in-the-basket method. I'm convinced that some greater power is up there watching over us and makes sure that all of our sandwiches turn out okay. Some sort of sandwich deity. 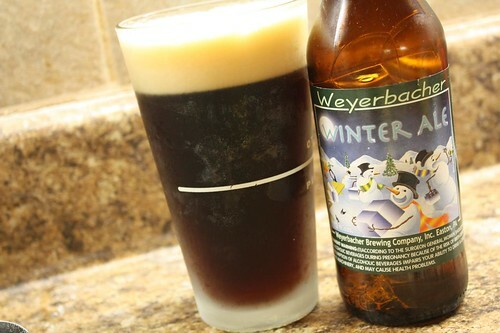 For beer I chose a nontraditional match to Croque Monsieur by having this Winter Ale from Weyerbacher. This is fine considering that this was a very nontraditional Croque Monsieur to begin with. This beer was quite tasty. This brewery also made a great pumpkin ale in the fall that sold out immediately so I snatched this one up as quickly as I could. It was as dark as winter beers tend to be but not as overpoweringly bitter or spicy as I find most of them. It was great to have one that is not infused with all manner of nutmeg and allspice. 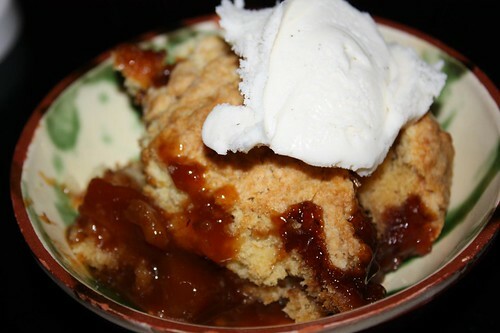 For dessert Jen made this apple pandowdy which was fantastic with a little vanilla ice cream on top. To further cleanse our palates we watched Christmas in Connecticut. This is our second year in a row with this movie on our Christmas movie list and it's a great addition. Particularly since we live so close to Connecticut now that we can be considered honorary Connecticutians. Connecticutites? G. Love With No Special Sauce . . . and Special Sauce! Last night I was planning on going home and making some Reubens. Instead I got a call from Jen that she'd been invited to a private G. Love concert and that he'd be performing songs from his new album, Fixin' To Die which is being released on February 22, 2011. Being a huge fan of the man I jumped on the train and headed into the city. The only other times I've seen him he has been performing with Special Sauce so this was rare for me. He even performed one of my favorite tune, Fresh Lila, which I was able to capture on video. However, after a while I started to feel bad that he was all by himself without Special Sauce. However, tonight, I made up for that with my own special sauce (see what I did there?). 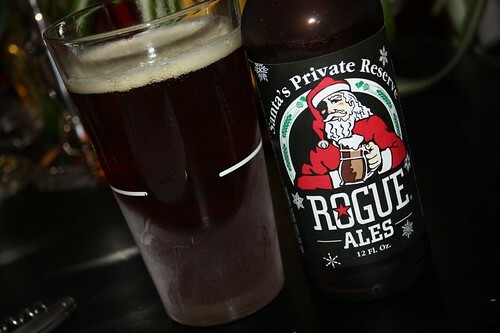 I had brewed up this batch the other night when I made my turkey Reubens from our Thanksgiving leftovers. Tonight I used it again to make Reubens out of our Hanukkah leftover. I guess I'm a bit of a one trick pony. For dinner tonight I used a bunch of leftovers. I used the leftover brisket, Swiss cheese, special sauce, fresh seeded rye bread, and sauerkraut to make these Reubens. I also made sweet potato fries. Much to my surprise as soon as I peeled the sweet potatoes they were white! I've had white sweet potatoes before but they usually had a distinct pale skin whereas these had a dark reddish skin similar to normal sweet potatoes. While I didn't achieve the color I was looking for they still roasted up nicely and were delicious. I seasoned them with Old Bay, salt, and pepper. Also I made this cabbage slaw with the leftover cranberry relish, mayonnaise, Maille mustard, dried cranberries, a little hot sauce, cider vinegar, salt, pepper, shredded carrot, and julliened red onion. We also had some pickles we picked up last week at the farmer's market in town from Dr. Pickle who is apparently a pickle that got bitten by a radioactive MS Paint which gave him the super power to be poorly rendered on a web page. Good pickles though. This was maybe not quite as good as the turkey Reubens had been but at least 95% as good. For beer I had an Estrella Daura which is a Spanish gluten free beer. I mostly had it out of curiosity. It was a very tasty pilsner-style beer. And the best part is that if I've developed celiac disease overnight I am safe! Except for the rye bread I suppose.